Radisson Blu Ridzene Hotel, Riga, Latvia. Rates from LVL54. 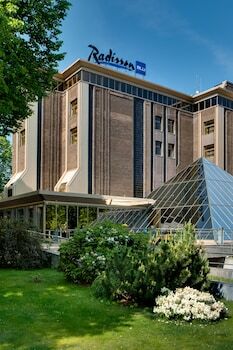 Radisson Blu Ridzene Hotel is a luxurious 5-star property conveniently located near the centre of Riga. Local tourist attractions such as Bastion Hill, Esplanade Park and Laima Clock are not far from the hotel. Also easily within reach are Freedom Monument, Latvian Art Museum and Cathedral of Christ's Nativity. Room facilities include climate control and direct-dial phone. Other room amenities include minibar. Bathroom amenities include complimentary toiletries, hair dryer and makeup/shaving mirror. Entertainment: In-room entertainment options at Radisson Blu Ridzene Hotel include pay movies and satellite television service. Internet connection options: Business guests will appreciate Internet access (complimentary) and wireless Internet access. Housekeeping services are also available. Dining facilities at Radisson Blu Ridzene Hotel include a restaurant. Breakfast is available - a surcharge will apply. There is also room service available. The hotel boasts a 24-hour front desk service. An ATM/banking facility is also available. Public areas at Radisson Blu Ridzene Hotel are comfortably air-conditioned. Other hotel amenities include library and patio. Leisure amenities: Guests can also enjoy the following spa/wellness facilities: sauna. Other services: complimentary newspapers in lobby, concierge services, dry cleaning/laundry service, elevator/lift, express check-out, laundry facilities, porter/bellhop, roll-in shower and television in lobby. Radisson Blu Ridzene Hotel offers transportation to/from the airport for an additional fee. Guest parking is offered for a surcharge in a garage. Making your reservation in Radisson Blu Ridzene Hotel is easy and secure. Simply select your dates of stay and click on the “Check Rates” button to submit the form.